An independent professional’s key to personal marketing success. Personal marketing is not something that most independent professionals claim to enjoy. I’ve heard everything from “it’s awkward” to “it’s hard” and I get it — it can take a lot of time, quite a bit of vulnerability and nonstop resilience. Promoting yourself can be uncomfortable. With the right strategy and tools in place, your personal marketing can be amplified without having to spend extra time and effort to get the same results. One powerful tool you can set up in just a few minutes is a landing page that calls for action. Call it a website, call it a profile, a splash page— whatever you want. Think about the link you’re sending people to from your social networks, your email signature, your website at networking events and beyond. Do people know what you want them to do once they’ve landed on your page? According to a study published on Insights by Stanford Business, people are more likely to help or agree to what you want if you ask directly. Translating that to a webpage — rather than inundating people with information and options, making what you want simple and explicitly clear will always yield better results. This sounds like common sense, but you’d be surprised how much clutter ends up on a website. If you want people to contact you, follow you, sign up or check out your content — tell them to. In the marketing world, these call-to-actions are one of the most important elements of marketing, and why every pop-up, ad, email and landing page has one. The person going to your landing page should know exactly what you want them to do within 8 seconds of looking at your page. As mentioned in a study by Microsoft in this Time article, 8 seconds is all you get before you lose someone’s attention. That means within 8 seconds of landing on your page, that person should be able to get who you are, what you do, and what you want them to do. Any additional click to a loading page will eat into those 8 seconds, and could be the difference between a new client and a lost prospect. Well, what if you have multiple goals or multiple audiences? Why miss out on opportunities, right? Actually, having too many choices is paralyzing, based on this study about human behavior and motivations. You’ll get a much higher rate of return if you choose one focused goal and give people one choice to make. So how do you choose that goal? Great question, now we’re talking. A) Have the most immediate impact. If you have a good idea about how you want to offer value and to whom, go ahead and ask for it. Use a simple and clearly visible call to action on your page. B) Create a line of communication so you can set yourself up to learn more about the person and eventually introduce your other goals. If the value you offer is complicated or varied, perhaps you’d get better results by having a conversation with your prospect. Since you know your services best, it’d make more sense to be able to learn more about the needs of your prospect so you can connect the dots and help them see how your solutions align with their needs. 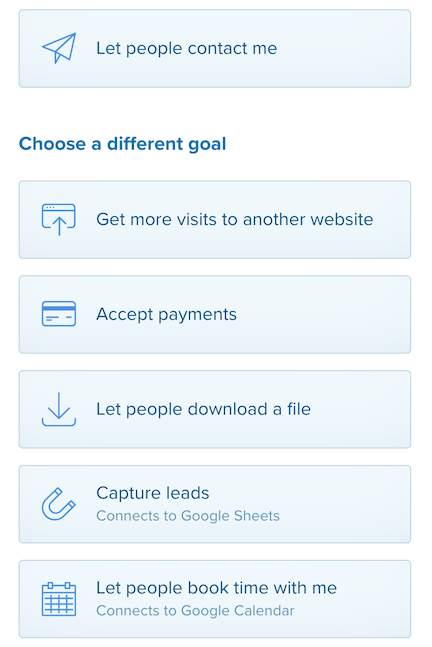 At about.me, we’ve outlined a few categories by goals to help you prioritize what’s most important to you. The words you choose for your call to action will be more of an ask, so choose casual language or professional language, depending on the tone of your personal brand. Once you have your goal in place, the rest of your page should support that goal. And to build that in a simple way, we’ll turn to the marketing framework called AIDA that outlines the journey a customer goes through from before they decide to connect with you. When it comes to your personal webpage, you’ll want to create a condensed version of the AIDA framework on your page. Let’s break it down, letter by letter. Your page visitor becomes aware that you have an online presence. Build awareness for yourself by getting a personalized link like yourname.com to make yourself easily discoverable and identifiable online. On your page, include basic info like your name, where you’re located, and what your title is. A photo of yourself on your page will also help with this step, as it puts a face to your name. Your page visitor is interested in who you are and what you have to offer. To build interest, you should have an idea of who your target audience is. Pretend like you’re talking to that person and surface details about who you are as a person and what you do professionally to build interest around the value you’d like to offer. Include details like what you’re curious about, interested in, passionate about in your bio section, and use natural language to make it personal. Add notable achievements or projects you’ve worked on to validate the offer you’re claiming to provide. The blend of your personal and professional details will help you create an authentic connection with your page visitor while building trust. One of the best ways to create validation around who you are and what you do is through social proof in the form of testimonials. Have you ever been interested in something because someone else was? Testimonials create that kind of an effect for you. Your page visitor connects with you and wants what you have to offer. At this point, the person viewing your page is curious — interested, even. But are they hooked? Do they see your value and how it could benefit them? There are a couple thing you can do to get that person locked in and ready to take action. Consider adding visual examples of your past work or what you have to offer in a digital portfolio. The saying “a picture is worth a thousand words” exists for a reason. An even more powerful tool is video. An intro or explainer video will increase conversion by up to 80% according to this Unbounce.com article. True, it takes more effort to create a video, but trust me when I say, the return is worth it. Your page visitor does what you tell them to do. Plain and simple, you get your page visitor to click on your call to action. A key way to making this happen is to have that one, simple, focused call to action visible at all times. Whether your page visitor just landed on your page, is viewing your portfolio, watching your intro video or looking through your photos — make sure your ask is clear and visible at all times. If you’re the type of person who’s very particular about how everything looks and have extra time and/or money to spend, you’ll probably want to create a custom page using a website builder with a whole lot of customization options or even build one from scratch. If you’re super busy, need something quick that looks professional, or want something that’s simple to manage with no coding or design needed, consider creating an about.me page. It’ll take you about 7 minutes to set up and we guide you through including all of the elements I mentioned so that your page gets people to take action.